When Google finally unveiled the Pixel and Pixel XL on October 4th, many people were put off by the price tag of the two phones. While Google is no stranger to sticking a premium price tag on their products, many users hoped that the two Pixel phones would continue bucking the trend of expensive off-contract prices. Alas, this was not the case, but at least most users appear to be very satisfied with their purchase judging by early user reviews of the devices on our forums. Although many technology journalists have drawn similarities between the Pixel and iPhone in terms of price, just how true is this similarity? According to an IHS Markit teardown of the device, it appears that the cost to manufacture the Pixel XL is $285.75. At an unsubsidized price of $769 before taxes, this means that the cost-to-sales price ratio for the Pixel XL is similar to the iPhone 7 Plus and Samsung Galaxy S7 Edge. In its press release, IHS Markit detailed how it determined the cost to manufacture the Pixel XL. 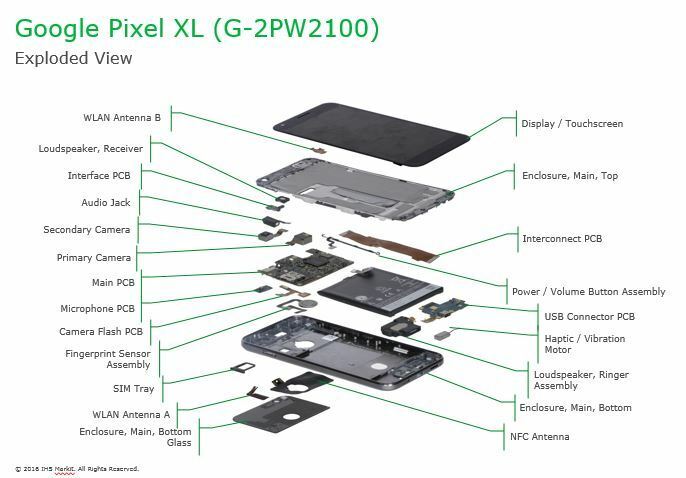 The company deconstructed the Pixel XL to its base parts and then determined the approximate price point of each component, while adjusting for bulk purchasing costs. After assessing the cost of each component, IHS Markit determined that the bill of materials for the base Pixel XL model with 32GB of internal storage costs $278. 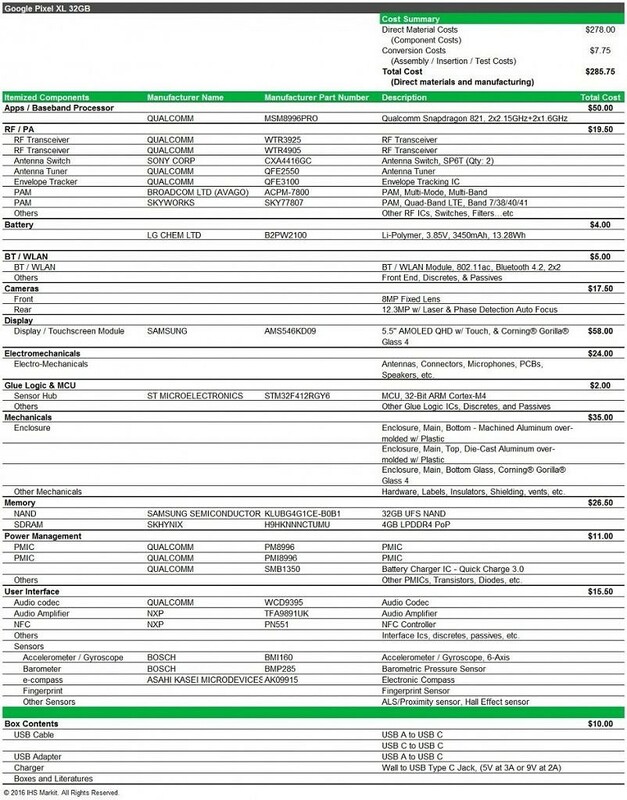 Add to that a $7.75 cost to manufacture the phone in an HTC factory, and you get the $285.75 price figure. 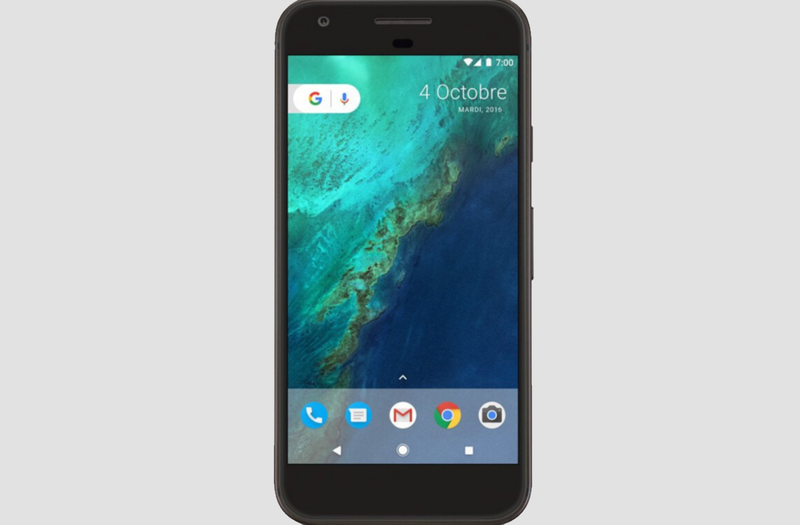 The company directly compares the manufacturing cost and design decisions of the Pixel XL to that of the iPhone and Samsung Galaxy S7 series, stating that the “total BOM costs for the Google Pixel XL are, not surprisingly, in line with those of other competitors, because the supply base and specs are very similar from phone to phone—whether it’s an iPhone, a Galaxy-series phone or the Google Pixel XL” – Andrew Rassweiler, senior director of cost benchmarking services for IHS Markit. While Samsung is facing a tumultuous time with its Note 7 disaster, Google’s Pixel XL arrives at the perfect time to challenge Samsung’s dominance in the high-end Android smartphone market. It’s clear that the Pixel XL was designed to compete with the upper echelon of premium flagship phones, and IHS Markit’s price teardown only solidifies that point.